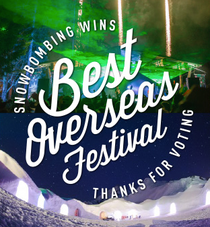 For the second time in four years, Snowbombing was recently voted 'Best Overseas Festival' at the UK Festival Awards 2013, beating a shortlist that included a host of overseas festivals including Exit Festival (Serbia), Tomorrowland (Belgium) and Outlook (Croatia). Snowbombing founder Gareth Cooper said: “We are delighted that Snowbombing has won best overseas festival for the second time in four years. This year’s event saw the likes of Kasabian who performed on a mountain top stage built especially for the occasion, Carl Cox who made his Snowbombing debut and Mercury nominated Disclosure and Rudimental take to the slopes. Hans the Butcher sold more than 24,000 sandwiches and a countless number of Jager Bombs were consumed which possibly all contributed to making Snowbombing 2013 the best to date!